An actual, real-life journalistic conspiracy to lie Obama into office. As a general rule, Scragged pooh-poohs those who see a conspiracy hiding around every corner. Yes, our current leaders are destroying everything that makes America American, but that's not because they are a secret cabal of Manchurian candidates. It's simply because they're ignorant and willfully mis-educated - as Reagan observed, "they know so much that isn't so." Hillary Clinton's accusation of the "vast right-wing conspiracy" is still a rich source of hoots and guffaws. 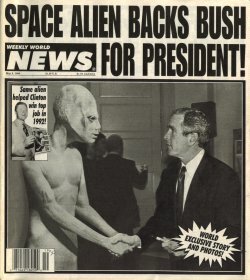 And no, we aren't particularly concerned about who was hiding behind the Grassy Knoll, or what's stashed in Area 51. In like manner, though there's never been the slightest doubt that the mainstream media is irredeemably biased, we just didn't believe that this was the result of a conscious conspiracy. Journalists all love Democrats and hate Republicans because they, individually and personally, are products of a leftist educational establishment and leftist elitist thought, are leftists themselves, and quite understandably sympathize with people who share their own views. In this, they're much like all racists everywhere - journalists prefer their own kind to people who're different. They don't have to actively conspire in order to all think alike; they're brought up that way through six years of Harvard, Yale, Berkeley and beyond. Or so we thought. Imagine our shock at the recent revelations of a true, genuine, real, thoroughly-documented, active conspiracy among well-known journalists to do everything the most febrile minds on the Right accused them of doing: lie, cheat, and steal to put Barack Obama in office. The investigative blog Daily Caller has recently released an explosive expose into an Internet online community known as JournoList. Like thousands of other e-mail listservs scattered throughout the intertubes, JournoList linked like-minded people with a unified interest in journalism. Until recently, there was a semisecret, off-the-record organization called Journolist. It was a listserv, which is a bunch of people who sign up (if allowed) and then get the same e-mails and can reply to everybody on the list. Or, put another way: No right-wingers need apply. Now, is there anything wrong with this? Not necessarily. Journalists by the nature of the job need to talk with all sorts of people, and they have the right to choose who among the millions of potential options they want to spend time with. Either way, the objective is supposed to be to ferret out news, to find out facts, to unearth hidden gems that the public should know about. In one instance, Spencer Ackerman of the Washington Independent urged his colleagues to deflect attention from Obama's relationship with [the racist, anti-American Rev. Jeremiah Wright by changing the subject. Pick one of Obama's conservative critics, Ackerman wrote, "Fred Barnes, Karl Rove, who cares - and call them racists." "Richard Kim got this right above: 'a horrible glimpse of general election press strategy.' He's dead on," Tomasky continued. "We need to throw chairs now, try as hard as we can to get the call next time. Otherwise the questions in October will be exactly like this. This is just a disease." Here we see "professional" journalists in all their squalor and degradation: devising a plan to bury a true story that harms their political favorite by pushing an accusation of racism they know to be false that attacks their political enemies. This is not the work of an honest seeker of the truth, but the lying machinations of a political hack! Sounds just like the climate researchers who tried to keep their opponent's views from being published. Unfortunately, this story rings true. One of the strangest aspects to the Jeremiah Wright story is that despite the repeated revelations of increasingly incendiary statements by Wright, everything from "God d**n America!" to calling the 9-11 terror attacks "America's chickens coming home to roost", the mainstream media steadfastly refused to seriously discuss the matter. This, despite Candidate Obama having attended this clearly racist, anti-white, and anti-American church for twenty years, with every major Obama life event from his wedding to his children's baptisms being performed by this bigoted "minister"! Whatever these "journalists" are, objective truth-tellers they ain't. Is this mess their fault? No. It's ours. Flounder, you can't spend your whole life worrying about your mistakes! You f**ked up... you trusted us! The people of America have made precisely this mistake regarding their mass media: Somehow, we have allowed ourselves to be persuaded that an unbiased media is possible. As long as we use human beings as journalists, reporters, and editors, however, there is no way to eliminate bias. Reporters will all have points of view that affects how they decide what stories are worth investigating; all editors have opinions regarding what things the public "needs to know"; all photographers automatically, unthinkingly frame their pictures to tell the story that they think should be told. This isn't evil, wrong, or unreasonable; it's human. Some people are more honest than others, of course, and most people quickly learn to tell who's who, but nobody expects total honesty from anyone. That's why courts of law want to hear from more than one witness and well-intentioned, truth-seeking people do too. A hundred years ago, American cities always had more than one source of news, sometimes many. There was the Republican paper, the Democratic paper, the labor-union rag, maybe a newsletter put out by the Communists. The wealthy had their own private news sources; the well-informed middle classes would subscribe to several different papers as well as a variety of newsmagazines. Each and every one of them had their own editorial biases and preferences; each and every one was well known for what their biases were. The existence of biases has not changed; today's journalists have them just as journalists of old. The only difference is that our journalists of today pretend not to - in other words, they blatantly lie. Why was it so scandalous when Helen Thomas was recorded saying that Israelis need to "get the hell out of Palestine" and go back to Germany and Poland? Her toxic anti-Semitism was known since Noah got off the Ark, but it wasn't revealed to the rest of us until an alert videographer used the Internet to reveal the truth which her colleagues had helped her to cover for lo, these many years. That truth wasn't at all new, really; it was only new to us. But given Thomas' long interest in reporting foreign affairs, it matters deeply that she denies the right of one of America's longstanding allies even to exist. Thomas' decades of "reporting" on all manner of issues looks quite different now that we know her true beliefs, don't they? We all know what Sean Hannity, Rush Limbaugh, Mark Levin, and Glenn Beck believe. We all know what Keith Olbermann and Rachel Maddow believe, too. These reporters are honest about their preferences and biases, so each of us can adjust accordingly. They may or may not be liars in every other way, but at least we clearly know where they are coming from. What about the writers of the New York Times and the Washington Post? How about the anchormen for CNN, ABC, and CBS? Mostly, they try to cloak their true opinions, though anyone alert knows them to be as far left as circumstances permit. This is wrong - not the having of opinions, but the masking of them. It's time to come out and publicly proclaim what everyone knows to be true: that MSNBC is far, far left; that CNN is center-left; that Fox is center-right; that the NYT, WaPo and LAT are far left but the WSJ is center-right. That way, all America will know that they're being lied to all the time. That's OK, as long as we know it - we're used to it in every other aspect of life, and can certainly cope so long as we all recognize the need to be on our toes. This puts the burden where it belongs: on each of us to find out the truth by listening to opposing views. As for the JournoListers, well, reports are that that secret cabal is back up and running under a different name. This time, however, anyone who cares to find out will know its members for what they are, and their "reporting" for what it is: nothing more than shilling for the Democratic Party, as we always said it was... but more so than we could imagine, even in our worst nightmares. "Journolist was limited to those from nonpartisan to liberal, center to left." Completely and totally destroys David Weigel credibility at the Washington Post. He's been one of their "conservative" bloggers for quite some time. After the Journolist leaks, it was revealed that he was a member and was secretly disgusted with lots of other conservatives. He claimed at the time - and still does now - that he regretted his comments but he's still an honest-to-god, real, true conservative. Hmmm.... How, David Weigel, did you get ACCEPTED to Journolist in the first place? Bunches of other notable conservatives - even centrist Republicans - have said they were denied access. But you've been a member in good standing for a long time. So among other things, Journolist helps the right take out its garbage - a corollary benefit, I suppose.